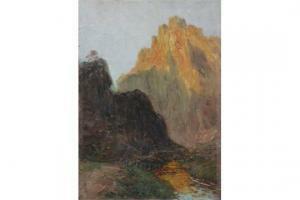 Find artworks, auction results, sale prices and pictures of Francois Richard De Montholon at auctions worldwide. This impressionistic painting is very special, as the French painter and graphic artist François Richard de Montholon (1856-1940) was born without arms and with only one leg. 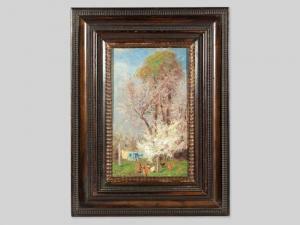 The painting shows a garden with different blooming trees. Pecking chickens and a rooster are seen in the frehround. There is a clothesline with drying laundry in the centre. The painting is signed \“F. de Montholon\” lower left. The painting has a multiply profiled wooden frame. 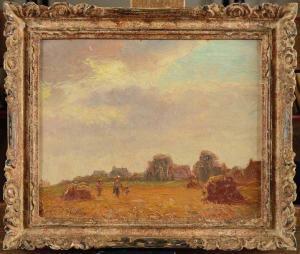 The painting and frame are in good condition with only minor signs of age and wear. The work including the frame measures 35 x 21.5 cm. 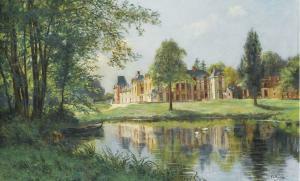 François Richard de Montholon began exhibiting his works in 1879. In 1900 he received an honourable mention for the Paris World Exposition. He studied under the painters Louis-Émile Dardoize, Gustave Boulanger and Jules Lefebvre. 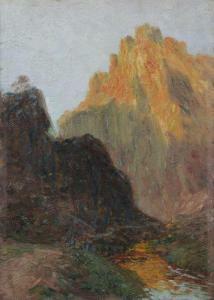 Montholon mainly painted landscapes in a post-Impressionist style. His works are found in the museums of Compiège, Valance, Abbeville, Troyes, Vannes and Boulogne-sur-mer.